Farouk Miya has struggled ever since his $400,000 move to Standard Liege in 2016. File photo. FOOTBALL–Uganda Cranes international Farouq Miya has been loaned out for the second time since joining Belgium giants Standard Liege. This time round, the former Vipers attacker has moved to Azerbaijan side Sebail FK. Sebail FK plays in the top tier of the Azerbaijan league despite the fact that it was founded only two years ago. Miya who went out on loan to Belgium Jupilar side Royal Mouscron in January 2017 had returned to his parent club Liege but could not force his way into the first team. Miya has been playing with the reserves ever since his return in the summer and maybe the 22 year old could use more playing time somewhere else in a bid to rejuvenate his career which is clearly in trouble. 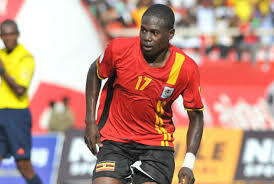 Miya was viewed as a brilliant prospect when he transfered from Vipers to Standard Liege in June 2016 for a fee of $400,000 after impressing in the top league but has failed to live up to the hype ever since. He has only featured in one league game since his move was made permanent in June 2016. Initially when the 22-year-old was loaned to Liege from January 2016 to May, he played a total of four league games and scored one goal. At Mouscron, Miya also found life difficult as he also failed to break into the starting team and hence featured in only four league games over a period of six months. The troubles he has had internationally have also troubled his Uganda Cranes form as he has been left out of the team on a couple of occasions, most notably in the later parts of the just concluded Russia 2018 World Cup qualifiers. Miya is the man that scored the goal that took Uganda to the African Cup of Nations after 39 years as the Cranes defeated Comoros 1-0 at Mandela National stadium in 2016. His last competitive goal for the Cranes can in the 1-1 draw against Burkina Faso at the AFCON finals tournament in Gabon where Uganda finished bottom of group D which also consisted of heavyweights Ghana and Egypt.